If you are looking for a quick evening meal packed with flavor, you’ve found it. 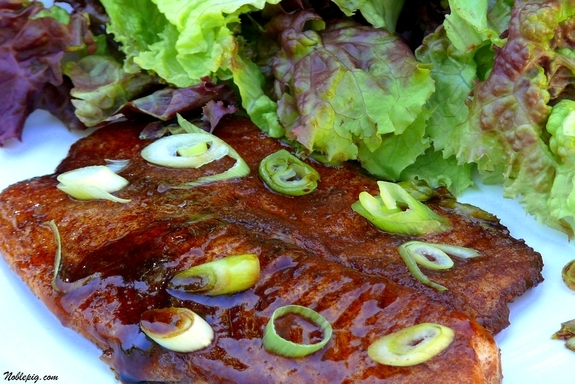 A blend of Chinese five-spice powder, soy sauce and brown sugar make a quick glaze for tilapia, leaving you with sugar-coated crusted piece of fish….it’s delightful! Five-spice powder is a blend of cinnamon, cloves, fennel seed, star anise and Szechuan peppercorns and is available in all grocery stores in the spice aisle. Already full of flavor, slip this piece of fish between a toasted-buttered bun for an incredible fish sandwich, you won’t be disappointed. 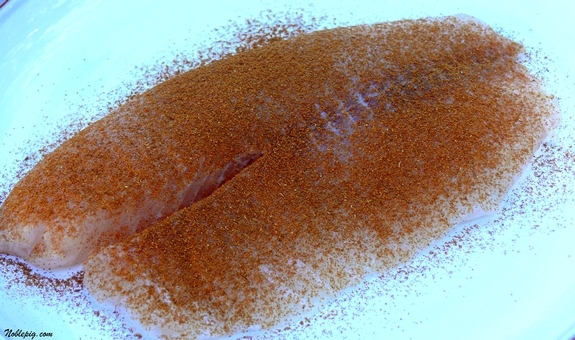 Sprinkle both sides of tilapia fillets with five-spice powder. Combine soy sauce and brown sugar in a small bowl. Heat oil in a large nonstick skillet over medium-high heat. Add the tilapia and cook until the outer edges are opaque, about 2 minutes. 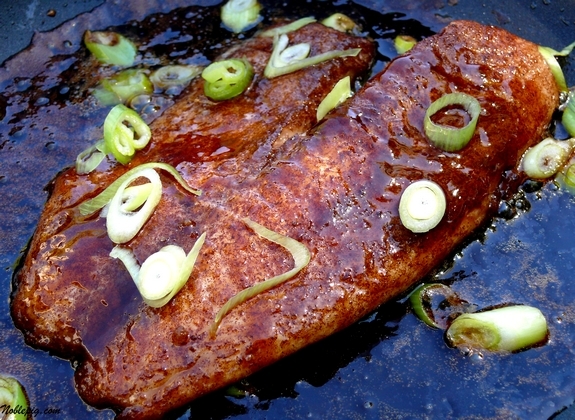 Reduce heat to medium, turn the fish over, stir the soy sauce mixture and pour over the fish and into the pan. Bring the sauce to a boil and cook until the fish is cooked through and the sauce has thickened slightly (make sure not caramelize sugar), about 2 minutes more. Add the scallions and remove from the heat. Serve the fish drizzled with the pan sauce. To make this dish for two, halve all ingredients (use 2 scallions) and prepare as directed. That is one beautiful piece of fish. It looks terrific! What a great summer meal. That looks very flavorful and I even have tilapia in my freezer! Oh my goodness Cathy-that looks amazingly wonderful. I haven’t cooked tilapia for a while…….methinks that may change very soon. Not a fish that I will find around here, but I am sure I can do this with any kind of fish….love five spice, especially if I have made it myself!! You have the best easy tilapia recipes! Love the way you have something sweet to balance out the 5 spice powder. Yum! Very delicious looking meal. Your photo of the presentation was absolutely perfect. I don’t know if it is because I have a new computer and pictures are more clear, but the lettuce in that picture depicted just how fresh and crisp it was such bright colors, alongside that filet of fish, so glossy with the basting sauce, it was almost like the plate was sitting right in front of me! Excellent photography! Cathy, this looks absolutely fabulous! We love Tilapia in spite of friends telling us it’s a *bottom feeder*. I think I personally like Tilapia because it’s usually thin and can be made crispy during cooking. This recipe is getting bookmarked, girlfriend! Thanks! So, how’s the corking/bottling thing going for you? Very well, I hope! Made this tonight and loved that sugary crust!! i really like the ingredients here. i think there is a nice balance, and tilapia is an excellent fish for this application. Great recipe! 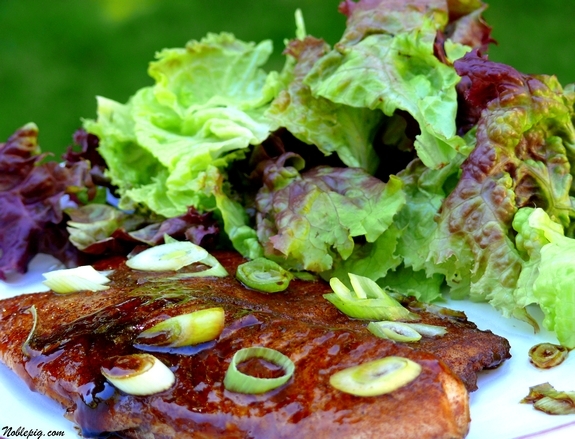 I want to cook with tilapia more because its so economical, but I’m usually short on ideas. Beautiful! I love tilapia and I am always looking for new recipes. Thank you for this recipe! My husband tends to turn his nose up at fish unless it meets the criteria of being fried or in the form of sushi. I made this for dinner last night and he nearly loved it. I now have a fish dish I can make at home. I made this for dinner last night, and OH MY! It was deliciouse and also passed the husband-test with flying colors. I have never used 5-spice and had some difficulty finding it, but it was worth the purchase. I did have a bit of trouble getting the fish done before the sugar started to carmelize, but I just added a bit of water to the pan and this worked out just fine. Thank you! I made this last night! OMG!!! Awesome!!! Well this one is a keeper. My husband, who refused to eat fish for the last 30 yrs. agreed to try it tonite. He said it hardly tasted like fish with this sauce. I’m not surprised as I’ve often thought of substituting chicken with tilapia to trick him as it’s such a mild fish. But this recipe hopefully opened his palate to trying other recipes with tilapia. I hope one day we may graduate to salmon! Actually this recipe would go very well with salmon too! Thank you for the great picture, I think it was the deal clincher.